✅ 22 PIECES RATCHETING WRENCH SET with mirror finish includes SAE and metric combination wrenches. This deluxe combo set makes emergency repairs a breeze. Speed up the work with this master set which is larger and more versatile than other 20 piece sets. ✅ SLIM PROFILE & EXTREMELY STRONG CHROME VANADIUM STEEL. The 72-tooth ratchet gears need only a 5-degree working swing arc. Full-drive box ends deliver reliable torque to tighten or loosen any bolt without rounding. 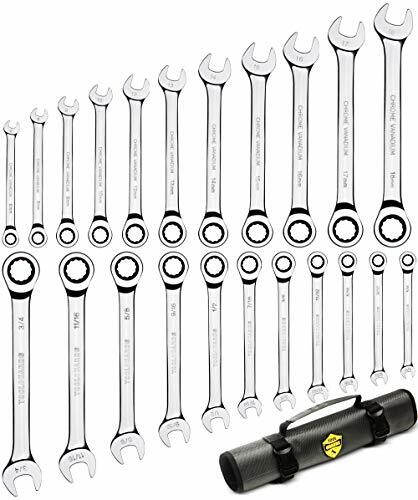 ✅ 11 METRIC + 11 SAE WRENCHES includes 6mm, 8mm, 9mm, 10mm, 12mm, 13mm, 14mm, 15mm, 16mm, 17mm, 18mm and 1/4″, 9/32″, 5/16″, 11/32″, 3/8″, 7/16″, 1/2″, 9/16″, 5/8″, 11/16″, 3/4″. ✅ LIFETIME WARRANTY insures your 22 pcs wrenches against manufacturer defects. ✅ GET BONUS TOOL ROLL WHEN YOU BUY TODAY for protection and storage of your 22 pc wrenches. The tool roll case has each wrench size printed which makes organizing easy. Add this premium quality set to your box today! If you have any questions about this product by ToolGuards, contact us by completing and submitting the form below. If you are looking for a specif part number, please include it with your message.